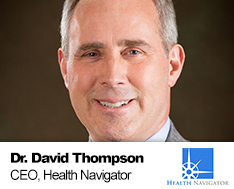 David Thompson, MD, serves as CEO and chief medical officer for Health Navigator, Inc. Dr. Thompson is the inventor of the Health Navigator Natural Language Processing (NLP) Engine and principal architect of the platform and clinical vocabulary. Dr. Thompson chairs the Health Navigator Medical Review Board. A part-time faculty attending in the Northwestern Memorial Hospital Emergency Department, Dr. Thompson also works as an author and partner with Self Care Decisions, LLC and Schmitt-Thompson Clinical Content, LLC. In a collaboration with well-known pediatrician Dr. Barton Schmitt, Dr. Thompson has developed a comprehensive set of telephone triage protocols that are used in medical call centers and doctors’ offices in the United States and internationally. Prior to working at Northwestern Memorial, Dr. Thompson worked in the MacNeal Hospital Emergency Department, where he served as medical director and chair of the Department of Emergency Medicine, and also provided medical direction over the medical call center. He has published numerous research articles and is the author of Adult Telephone Protocols: Office Version; 3rd Edition. Dr. Thompson lectures in the areas of telephone triage, medical coding, physician documentation, quality improvement, and patient satisfaction. Dr. Thompson received a Bachelor of Science in engineering from the University of Illinois, where he subsequently earned his medical degree. He is board-certified in both internal medicine and emergency medicine, having completed a dual residency at Northwestern Memorial Hospital at Northwestern University. Dr. Thompson is a Fellow in the American College of Emergency Physicians.